Now that we are past the girls’ parties, we can begin to focus on two important, fun walks in May. I know that family and friends cannot donate or join us at all events, but as we continue to live each day to it’s fullest as Ally beats the odds with SMA, we like to participate in these walks to have fun with friends and family, network with other families in our situation, and work towards a CURE for SMA and support for families. 1) The MDA Chicago District​ Muscle Walk will be held on Saturday, May 16th at Cantigny Park in Wheaton (Walk begins at 10am, registration and fun begin at 7:30am) and we’ll have a great time for a great cause. BIGGEST GOAL is to have family and friends JOIN US at the Park for the Walk and LOTS of FUN!!! If unable to join us, you can make a donation today, and help me reach my fundraising goal to help support the families who depend on MDA. Together, we grow stronger. 2) The IL Cure SMA – Illinois Chapter​ Walk-n-Roll will be held on Sunday, May 31st at Independence Grove in Libertyville. Registration and FUN begin at 8:30 and the Opening Cermony will be at 10:30. Our BIGGEST GOAL is to have family and friends JOIN us in the FUN at the Walk. The fee ($25 adult, $10 children 5-17, Free for children 4 and under) includes an official walk t-shirt and there will be raffles and tons of fun activities at the walk too. 3) I am a committee member for the Cure SMA Walk-n-Roll and currently we need help in 3 ways. a) We are looking for company sponsors to make a donation of $250 or more and one way you will be recognized is having your logo on the official walk t-shirt. You can even do this by donating at the link above and sending me your logo by May 13th (the sooner the better). b) We are collecting donations for our raffle table (creative baskets for adults and kids, gift certificates, tickets to anywhere…). If valued over $250 you can also be on our t-shirt. Notify me to arrange pickup. c) We are in need of a DJ with great speakers and a microphone who will donate their services or work at a fundraising rate. It can even be a youngin starting out as I’ve seen a few friends’ kids who have just started DJing. They could even earn volunteer hours for high school…. Notify me ASAP if interested in helping with any of the above. Thanks again for everyone’s continued support as we continue our journey with SMA. Above is the final information for Ally’s party. Although I started planning this quite awhile ago with a Facebook event, time got away from me and I never got a chance to mail out real invitations. We hope we will still get to see many friends and family!!! 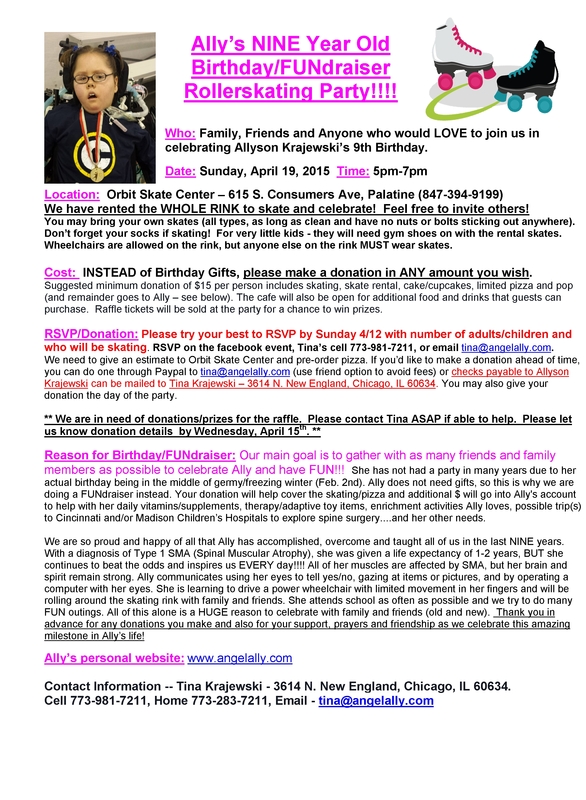 If you are interested in attending Ally’s Birthday/FUNdraiser, please reply ASAP. It is only ten days away!!!! Everyone is invited to have some FUN with us. If you are interested in making a donation or have a raffle prize/service etc to donate please also let me know so I can arrange pick-up. Thanks for your support!